I have always had a love and fascination of water. Before I left for a recent holiday in Anglesey, Wales, knowing that I’d have no WIFI, I downloaded the full series of Blue Planet and Planet Earth. I watched them between island exploration and was completely enthralled. Isn’t the underwater world fascinating? The array of creatures that live in extreme conditions, their incredible and unusual methods of survival are almost unbelievable! 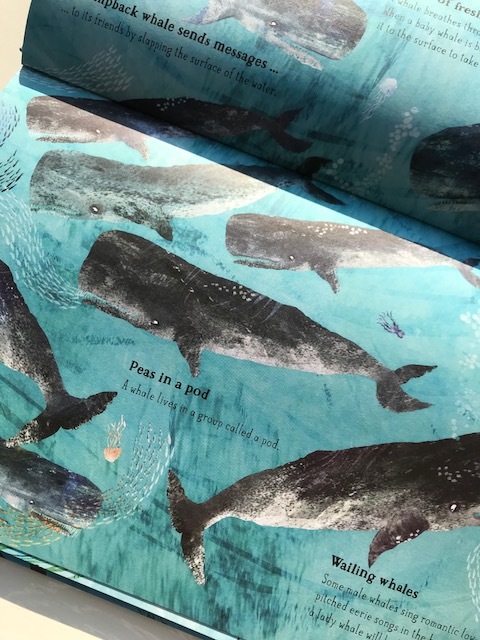 As I stood on the beach watching the great ocean crashing at my feet, and contemplating how far it had travelled and what lived out there, I felt compelled to share some relevant books ideal for getting your young ones interested in this vast other world. 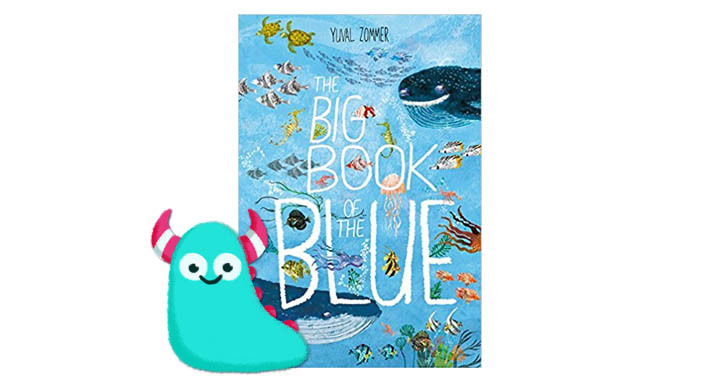 Today I’m going to look at The Big Book of the Blue written and illustrated by Yuval Zommer and published by Thames & Hudson. I love non-fiction books. It always gives me an absolute thrill when children borrow them from the library, clutched in their hands books about dinosaurs or tractors, you know that this book will tell a whole new kind of story, one of truth. Non-fiction picture books are a fantastic way of introducing young children to information within a picture book style setting. Yuval Zommer has this genre down to a fine art! His series of books cover topics such as bugs, beasts, the underground and the skies and now, underwater creatures. 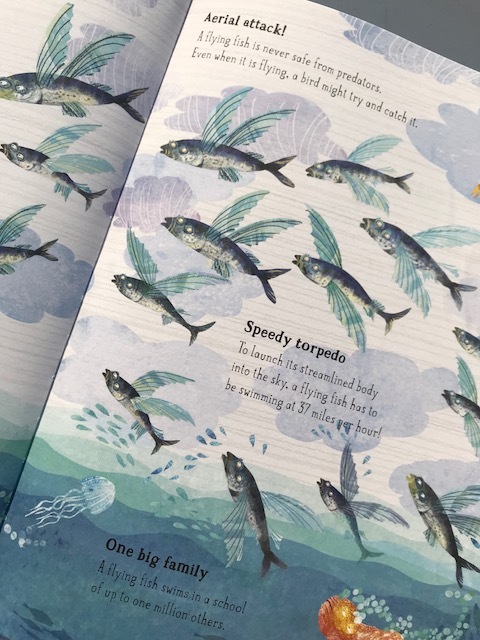 The Big Book of the Blue takes the reader on a journey of discovery exploring oceans and rivers to meet all the crazy fish and creatures that inhabit them. Did you know fish could fly? Or that a fish is the second most poisonous animal in the world? This book answers numerous questions, introduces children to amazing creatures such as the Angler Fish, different kinds of sharks and seals and some of the most clever and beautiful fish in the ocean. 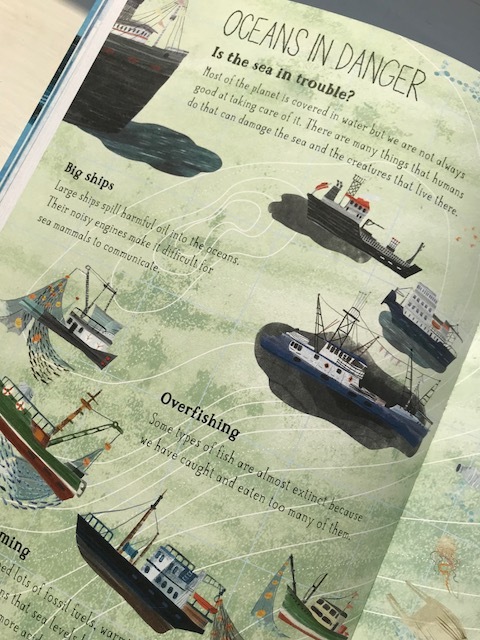 The book also covers environmental issues affecting our oceans such as pollution, over fishing and global warming making it entertaining, but also a very relevant and useful tool for primary schools. 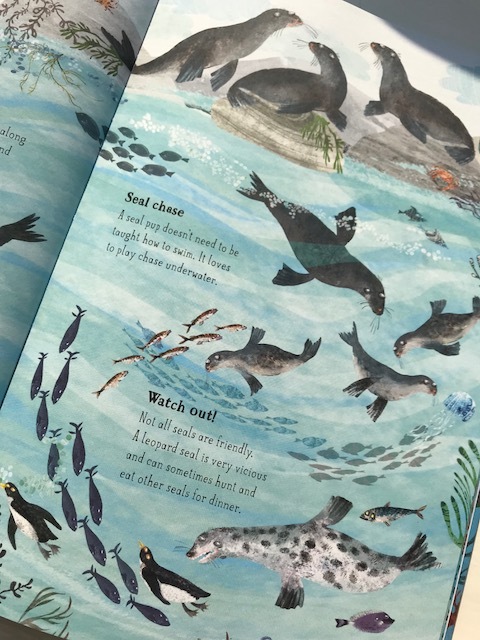 Among this array of factual snippets, there is a seek and find challenge on some of the pages, allowing children to interact with the book, a lovely little touch to keep children interested, although I’m sure this won’t be a problem with all the interesting facts on every page! The lovely aspect of Yuval Zommer’s books are that they are fully illustrated making this book a fantastic introduction to factual books for young chidren and just more bright and colourful and stylised a version. We get Yuval’s quirky and often funny take on these amazing creatures. It then leaves the opportunity for children to explore further to look up photos of the creatures and then come up with their own artwork and interpretations of them. There’s just a huge amount o scope for a book like this educationally, BUT, first and foremost it’s a fascinating,surprising, entertaining, and first rate non-fiction water based read for everyone! The Big Book of the Blue is available now from all good bookshops and libraries. Thanks to Thames and Hudson for sending me a copy of The Big Book of the Blue and thank you for reading this ocean worthy Book Monster review.